Annual. 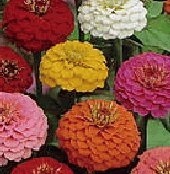 Zinnia elegans. Open Pollinated. Plant produces colorful blossoms of round flowers in various crayon colors. This variety will add interest and texture to your garden. Excellent flower arrangements too! This annual continuously blooms all season.